The Planck satellite, launched by the European Space Agency, made observations of the cosmic microwave background (CMB) for a little over 4 years, beginning in August, 2009 until October, 2013. Preliminary results based on only the data obtained over the first year and a quarter of operation, and released in 2013, established high confidence in the canonical cosmological model. This ΛCDM (Lambda-Cold Dark Matter) model is of a topologically flat universe, initiated in an inflationary Big Bang some 13.8 billion years ago and dominated by dark energy (the　Λ component), and secondarily by cold dark matter (CDM). Ordinary matter, of which stars, planets and human beings are composed, is the third most important component from a mass-energy standpoint. The amount of dark energy is over twice the mass-energy equivalent of all matter combined, and the dark matter is well in excess of the ordinary matter component. This general model had been well-established by the Wilkinson Microwave Anisotropy Probe (WMAP), but the Planck results have provided much greater sensitivity and confidence in the results. Now a series of 28 papers have been released by the Planck Consortium detailing results from the entire mission, with over three times as much data gathered. 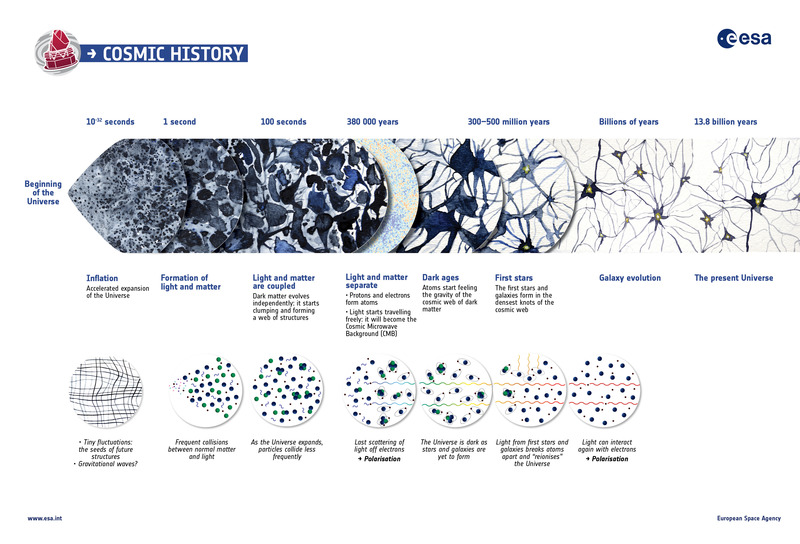 The first paper in the series, Planck 2015 Results I, provides an overview of these results. Papers XIII and XIV detail the cosmological parameters measured and the findings on dark energy, while several additional papers examine potential departures from a canonical cosmological model and constraints on inflationary models. Ωb*h² = .02226 to within 1%. Ωb = .048, with uncertainty around 3% of its value. Thus, just under 5% of the mass-energy density in the universe is in ordinary matter. Ωc*h² = .1186 with uncertainty less than 2% and with the h value substituted we have Ωc = .258 with similar uncertainty. 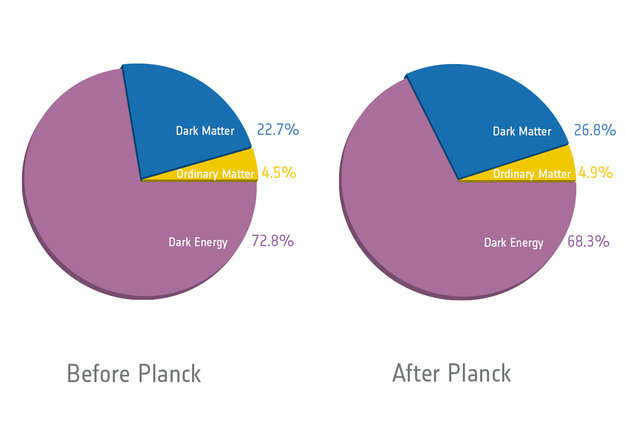 So in approximate percentage terms the Planck 2015 results indicate 69% dark energy, 26% dark matter, and 5% ordinary matter as the mass-energy balance of the universe. These results are essentially the same as the ratios found from the preliminary results reported in 2013. It is to be emphasized that these are present-day values of the constituents. The components evolve differently as the universe expands. Dark energy is manifested with its current energy density in every new unit of volume as the universe continues to expand, while the average dark matter and ordinary matter densities decrease inversely as the volume grows. This implies that in the past, dark energy was less important, but it will dominate more and more as the universe continues to expand. Why is dark energy produced as the universe expands? The simplest explanation is that it is the irreducible quantum energy of empty space, of the vacuum. Empty space – space with no particles whatsoever – still has fields (scalar fields, in particular) permeating it, and these fields have a minimum energy. It also has ‘virtual’ particles popping in and out of existence very briefly. This is the cosmological constant (Λ) model for the dark energy. This is the ultimate free lunch in nature. The dark energy works as a negative gravity; it enters into the equations of general relativity as a negative pressure which causes space to expand. And as space expands, more dark energy is created! A wonderful self-reinforcing process is in place. Since the dark energy dominates over matter, the expansion of the universe is accelerating, and has been for the last 5 billion years or so. Why wonderful? Because it adds billions upon billions of years of life to our universe. The Planck Consortium also find the universe is topologically flat to a very high degree, with an upper limit of 1/2 of 1% deviation from flatness at large scales. This is an impressive observational result. One of the most interesting results is Planck’s ability to constrain inflationary models. 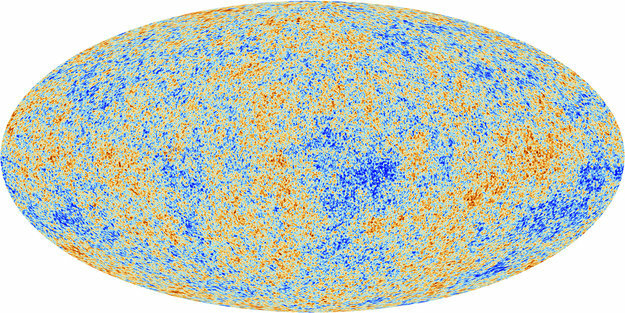 While a massive inflation almost certainly happened during the first billionth of a trillionth of a trillionth of a second as the Universe began, as indicated by the very uniformity of the CMB signal, there are many possible models of the inflationary field’s energy potential. We’ll take a look at this in a future blog entry.